Now, I can't claim any old Southern heritage, and, growing up, biscuits were popped out of a blue paper cylinder, but I just LOVE buttermilk biscuits. I also love strawberry shortcake, and this recipe does "double duty", as it works perfectly for either. Here is my favorite recipe. It makes enough for a brunch party, but you can halve it easily, and end up with 6 huge biscuits, or 8 normal sized ones. Do you have buttermilk in your fridge? Probably you don't, but you have options. The recipe works with plain-old milk, half and half, and also plain yogurt. You can also keep dried buttermilk powder in your pantry forever-- follow the directions on the package-- or you can make your own buttermilk by mixing one cup of milk with 1 1/2 teaspoons of white vinegar. Let it stand for 5 minutes, it will bubble up a bit, stir it up, and... voila a cup of buttermilk. The biscuits pictured above had about a 1/2 tsp. of thyme leaves and a handful of shredded cheddar added. Since the recipe makes a LOT of biscuits, I like to mix up the dry ingredients and work in the butter, then remove half of the mixture and store in the freezer in a storage container for another batch that will only need the buttermilk to be stirred in. See, I am not totally against "processed food". Just make sure you label the contents, and... if you store the mixture in a seal-able bowl, you can just stumble into the kitchen in the morning, turn the oven on to heat and dump the buttermilk right into the storage bowl, and mix it up quickly! Preheat oven to 425°F. Mix flour, sugar, baking powder, salt and baking soda in large bowl to blend. Using fingertips, rub butter into dry ingredients until mixture resembles coarse meal. Add buttermilk and quickly stir until evenly moistened. (don't overwork the dough, or the biscuits will toughen). 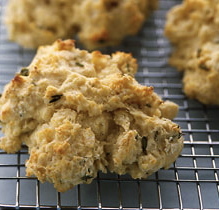 Use a lightly oiled 1/4 c. measuring cup or an ice-cream scoop to drop biscuits onto baking sheet, spacing 2 inches apart. Bake until biscuits are golden brown on top, about 15 minutes. Cool slightly. Serve warm with butter, and your favorite honey or jam. This is an awesome dessert! Now I'm craving for strawberries!